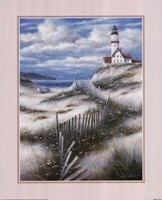 A lighthouse built on top of a hill appears in the background of this artwork, with an abandoned canoe lying idly on the sand beach. Despite the seemingly stillness of the image, artist T.C. Chiu subtly suggests an animated day at the seaside. In stark contrast with the immobile canoe and towering lighthouse, a flock of seagulls is flying above the beach, while yachts are racing at the horizon. The image is consistent with other paintings of Chiu, who combines contemporary painting techniques with traditional realism. He has a propensity for warm colors and “Lighthouse with Deserted Canoe” is a colorful depiction of a regular day at the seaside. This peaceful image radiates tranquility with smart use of watercolors. Framing it in a dark frame would make an excellent addition to private residences.